This year Fix a Leak Week runs March 18th-22nd. Join our team of leak detectives across the country to hunt down leaks in your home and yard. If your water meter spins while all faucets and irrigation are shut OFF, you may have a leak that needs fixing. Even a little leak can waste a lot of water… and money on your water bill. Being a leak detective is easy and we are here to help. including worn toilet flappers, dripping faucets, and other leaking valves. Get your checklist to get started. Using your water meter is a great place to start looking for leaks. Make sure you’re turned off all faucets and appliances and the head to the curb to find your water meter. Watch this video tutorial to see how to use your water meter as a leak detective. En español: Aprenda comó detectar y arreglar fugas en su baño aquí. Fix the leak: Check the faucet washers, gaskets and seats for wear and replace them if necessary. On rare occasion you may need to replace the entire faucet. Choose an efficient faucet if you have to go this route. Fix the leak: Clean and adjust your sprinkler heads as necessary. If your spigot or hose leak, replace the nylon or rubber washer and ensure a tight connection to the spigot using pipe tape and a wrench. Fix a Leak Week is sponsored by the US EPA. 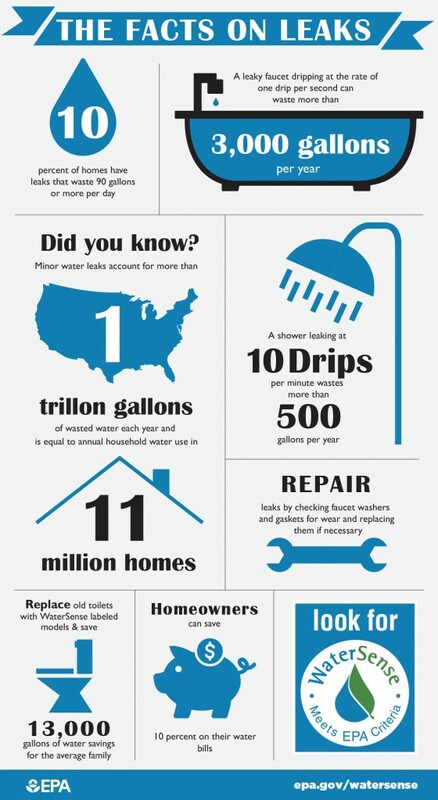 Check out their resources for finding and fixing leaks in your home.